But don’t despair! In the future, you’ll be able to build those sandcastles or snowmen, all without falling behind in the game. In our ongoing efforts to make the game more accessible to everyone, we’ll soon bring a new feature to all our live game worlds: vacation mode. Once activated, vacation mode will make it impossible for other players to attack you (or indeed send any troop movements toward your villages) for a period of time. In turn, you won’t be able to send your own troops anywhere (except for sending back reinforcements received before your vacation). Plus, your wood, clay and iron production as well as your troop training will come to a halt. If you have activated the premium resource bonus, it will of course also be paused and wait for your return. Crop production, however, will continue as usual, allowing you to feed the troops you had already built up before your vacation. How do I set it up? How does it work? It’s actually as simple as selecting how many days of vacation you want to use in the options menu. You’ll have a total of 14 days (7 days on speed worlds) available per avatar and can distribute them however you like. The confirmation button will then start a 48-hour countdown (24 hours on speed game worlds) during which you will not be able to send attacks or sieges anymore (i.e. only reinforcements, scout movements and raids). This restriction is necessary so that you cannot exploit the feature, for example, by using it to make yourself invulnerable after a last big attack against your enemies a minute before your vacation protection takes effect. After this initial countdown, your vacation days will start to be counted and the above-mentioned rules will take effect. While vacation mode will automatically end after the number of days you specified, you can also cancel it at any point before. But be aware that once started, a vacation day will always count as a full day and you will not be reimbursed in any way. Speaking of restrictions, if you are a king or duke, your victory point production will also be stopped while you are in vacation mode. So it might be a good idea to arrange for a substitute in time, or at least move your active treasures to another player so your kingdom does not miss out too much in terms of victory point production while you are away. Also, to prevent players from abusing the vacation mode to delay the endgame, you will not be able to enter vacation mode if you happen to own a Wonder of the World village. In addition to this, taking a vacation break will naturally come with some opportunity costs and you will fall behind somewhat while you are away. However, not permanently! We want it to be a viable option even for good players ranking high in all the statistics. For this reason, players will be put into a “boosted” state after their vacation to have the potential to catch up. 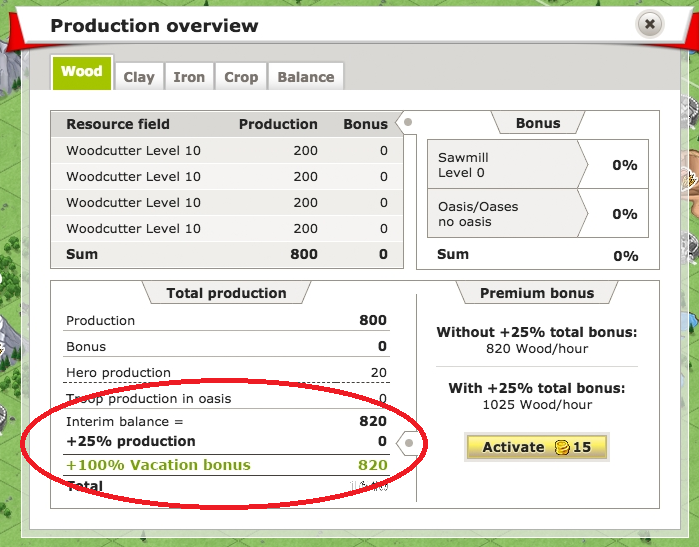 This means that your resource production and troop training speed will be doubled for the same amount of time that you were under the protection of vacation mode. This little sprint enables you to make up for the lost time in the game and get back on track. Be aware though, that as long as your boost is active, you will not be able to start another vacation right away. All in all, we hope that this feature will make it easier for you to commit to playing a full server of Travian Kingdoms. The ability to completely step away from the game for a few days or even a couple of weeks should hopefully allow it to fit into your daily life much better. Let us know what you think about our vacation mode in the forum!